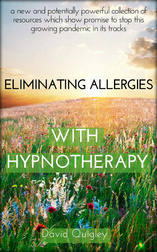 In this section we share some very dramatic allergy healing testimonials. We contacted the Academy and were told our only remaining option was to challenge the disqualification in the first place. If we could prove he did not have the allergy then he could still get in. While it was an option, it did not feel very likely as my son had suffered allergies to seafood for many years and conventional wisdom says there is no cure, that once a food allergy is encountered the subject should avoid that food for the rest of their lives. I began searching for cures to allergies. Online I found documented studies where individuals that suffered from split personalities would have a severe life- threatening allergy to peanuts with one personality, while the other personality(ies) would have no issues whatsoever with it and could eat peanuts or peanut products routinely. As I looked into this further, I ran across a reference to the Alchemy Institute of Hypnosis in Santa Rosa, and a David Quigley who claimed to have cured allergies with hypnosis. My son had found the very same option in his online research. We contacted David and set a series of 3 office appointments and 3 telephone appointments. After one appointment with David Quigley my son ate three shrimp with only minor discomfort in the back of his throat that lasted less than an hour. After the second appointment he ate seafood pasta at a restaurant that contained a whole lobster tail, shrimp, clams, jumbo scallops and crab. He had minor lip swelling for about an hour. After the third appointment there were no more reactions. David Quigley is a hidden treasure of great value. I heard long ago that the mark of a company or provider with great integrity is that they provide a service or product that is far more valuable than the compensation being asked for. That fully describes David. It is hard to put a value or cost on what a change in one's life is worth but in my son's case a minimum value is clear. His appointment to the US Air Force Academy represents a $400,000 scholarship, and of course immense opportunities after college will increase that value. With just three office appointments (in two days) with David, my son's allergies were eradicated and the appointment to the academy restored. David, I am immensely grateful for your help with my son and his air force academy aspiration. He is doing great, finished Basic Cadet Training and graduated from that last Tuesday and started classes this morning. I attended the Advanced Somatic Healing workshop in New York City to get help with my asthma. For about 30 days before the workshop, I had experienced major problems with asthma. At that time I was using my inhaler several times a day, and I was unable to take public transportation to work or be outside for long periods of time. On the first day of the workshop I saw some amazing healing experiences occur as David Quigley worked with other participants. On the 2nd day of the workshop David divided the workshop participants into two groups and it was my turn to experience Somatic Healing. I have been able to take public transportation to and from work ever since attending the workshop. I am still overcoming asthma, but my symptoms are not as bad as what I had experienced before taking the Advanced Somatic Healing workshop. Also, in the 4 weeks since I attended the workshop, I have only had to use my inhaler 2 times versus using it everyday the previous 30 days before attending the workshop. Overall, the results from using Alchemical Hypnotherapy have been truly amazing! I can honestly say that attending the Advanced Somatic Healing workshop has been a wonderful and life changing event.